Head outdoors with a CRKT Zilla Tool. This is a multi-purpose tool with a comfortable ergonomic handle that lets you get work done. 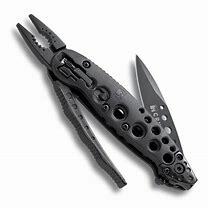 This hand multi-tool features metallic surfaces that are bead-blast, while the rugged scales are injection molded black Zytel. It makes a suitable choice for hiking, fishing, boating and more. With pliers, wire cutters, wire strippers, hex bit storage, knife blade and the ability to open bottles, this CRKT tool is one that you'll carry with you all the time. It's convenient, versatile and easy to use, making it a practical gift for the outdoorsman in your life. Use it to cut ropes, wires, loosen and tighten bolts and more. The CRKT Zilla Tool comes with a protective nylon pouch to keep your device safe when not in use.